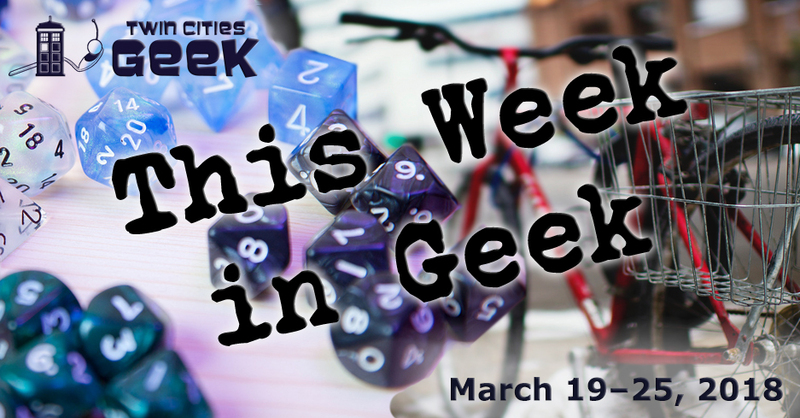 Welcome to This Week in Geek, your guide to events of interest to the Minnesota geek community for the week of Monday, March 19th to Sunday, March 25th. When: Monday, March 19th at 6:30 p.m.
Let your creativity shine with drawing, painting, crafting, or whatever your heart desires at Creative Night, a weekly event put on by Crafty Geek and the Geek Partnership Society. This is a free event, so bring some of your own stuff to work on, some snacks, and hang out in a collaborative space. When: Monday, March 19th at 7:00 p.m.
Books & Bars is an “open public book club show” hosted and moderated by Minnesota Public Radio senior producer Jeff Kamin that provides attendees with “a unique atmosphere for a lively discussion of interesting authors, fun people, good food, and social lubrication.” The book being reread and discussed for this special event is Ready Player One, in anticipation of the upcoming film. Be on the look out for special hidden prizes! When: Monday, March 19th at 7:00 p.m., Thursday, March 22nd at 7:00 p.m., Friday, March 23rd at 7:00 p.m., Saturday, March 24th at 7:00 p.m. While Hamlet is likely familiar to you, Wayward Theatre Co’s choice to bring the play outside of traditional theater settings is probably less so. Enjoy Shakespeare’s classic tragedy in a golden-age mansion and see the way that the space is used to realize themes of opulence and power inherent in Hamlet. Tickets are between $30 and $50, and this play will run through much of March. Come to the Loft Literary Center for an event that dives deep into the world of Donald Trump’s “fake news,” goes back through American history to P.T. Barnum’s “humbug,” and more. This in-depth talk will look at the ways hoaxes have shaped our history, and fed into racist stereotypes and reality manipulation. This event is hosted by local author and professor Marlon James, and Kevin Young, director of the Schomburg Center for Research in Black Culture and author of Bunk: The Rise of Hoaxes, Humbug, Plagiarists, Phonies, Post-Facts, and Fake News. Tickets are $15. Slayers and Buffy fans unite for this night of trivia about vampires, teens, and other Buffy the Vampire Slayer-related topics at BlackStack Brewing. Bring a Scooby Gang together and compete for prizes, all in a great St. Paul brewery. Costumes welcome! When: Tuesday, March 20th at 7:00 p.m.
Say happy birthday to everyone’s neighbor, the delightful Mr. Rogers, at Mister Rogers’ Birthday Party! Take in classic episodes of Mister Rogers’ Neighborhood, enjoy puppet and mask-theater performances from In The Heart of the Beast, eat some cake, and enjoy the cash bar. This is the inaugural event of Nostalgia Nights—a new event series hosted by Twin Cities PBS—so look for similar events in the future. Nostalgia Nights are 21+, and free with an optional donation. Café Scientifique—presented by the Bell Museum of Natural History—is “a happy hour exchange of ideas about science, environment, and popular culture, featuring experts from a variety of fields on diverse and often provocative topics.” This month’s topic is Art & Environmentalism, and will be led by Adam Kay, Director of Environmental Science at the University of St. Thomas. Tickets are $5 to $12, online or at the door. Come and experience YogaQuest, a blend of yoga and fanfiction storytelling led by certified yoga instructors. Experience a yoga workout experience and a story at the same time. This week’s theme is Pacific Rim, so prepare for drift compatibility. This event costs $15. Enjoy a night of community and tea with Tea and Meeples, a weekly gathering of friendly geeks at Panda Castle in Richfield. Cozy up for the winter and read with some pals. When: Wednesday, March 21st at 6:30 p.m.
Speculations, a coproduction of DreamHaven Books and SF Minnesota (the hosts of Diversicon), continues with a reading from Rob Callahan (writer and award-winning former journalist), Amina Harper (artist and writer), and J. E. Herald-Zamora (educator and actor). This free event includes a reception with soda and cookies, and the reading will be followed with an expedition to a nearby bistro. When: Wednesday, March 21st at 7:00 p.m.
Twin Cities film group Trash Film Debauchery, a group that “has been satisfying your unsavory cinema needs since 2003,” will return to the Trylon for a night of Gary Busey. Tickets are $5 for this mystery screening featuring Gary Busey as a murderous-gingerbread man! When: Thursday, March 22nd at 6:00 p.m. This meetup hosted by the Hack Factory is a recurring hack night for hackers who want to dig in deep and make things. The intended audience here has a more-than-superficial understanding of coding frameworks and wants to collaborate and build. Areas of focus include C code and the Unix philosophy, networking and Internet protocols, cryptography, compression and error correction, compilers, and profiling. When: Thursday, March 22nd at 6:30 p.m. When: Thursday, March 22nd at 7:00 p.m.
At this event hosted by Preserve Minneapolis, Andrea Swensson will discuss her new book Got to Be Something Here: The Rise of the Minneapolis Sound. She will by joined by Davu Seru, the author of Sights, Sounds, Soul: The Twin Cities through the Lens of Charles Chambli, and there will be a discussion and Q&A regarding both books. You can also check out our recent piece for more details on Andrea Swensson’s book! When: Thursday, March 22th at 7:00 p.m.
Geek Slink is a belly-dance class intended to be a welcoming and safe space to focus on fun, fusion, and fitness. Classes are open to any level of experience, body type, and gender. Classes are $15 for walk-ins, or $60 for a five-class punch card; free trial classes are available. The Girls Only Comic Club hosts a Weekly Comics Chat on Thursday nights at the Kitty Cat Klub, where there will be “Coffee! Comics! Waffles! Talking!” Additional information about this event is posted on the Girls Only Comic Club’s Facebook group. Individuals interested in attending are encouraged to join. When: Thursday, March 22nd at 8:00 p.m. This regular event at Clockwerks Brewing—hosted by Sam Spadino and Sidney Oxborough—represents the convergence of two geeky favorites: a steampunk-themed bar and absurd trivia. Trivia Against Humanity has also expanded and now has weekly events at Glam Doll on Tuesdays and Modist Brewing Company on Wednesdays. When: Friday, March 23rd at 6:00 p.m.
Mischief Toy Store in St. Paul invites you to experience some Magic with them this Friday night for the Magic: The Gathering Iconic Masters draft event. Entry is $20, and all players will receive prizes, including a “fancy promo card.” This weekly event is limited to 24 players and typically lasts until about 9:00 p.m. All skill levels are welcome. When: Friday, March 23rd at 7:00 p.m.
All good things must come to an end, and YogaQuest will be saying farewell to its longtime studio in the Lyn-Lake area. Come on by to celebrate the memories and look forward to adventures in a new space. There will be something of a yard sale to help minimize before the move; see the Facebook event page for listings. When: Friday, March 23rd at 8:30 p.m. When: Saturday, March 24th at 9:00 a.m. to Sunday, March 25th at 3:00 p.m.
Geo:Code is a community-generated conference focused on the intersection of cities, government, and technology. It explores how we can use modern data-driven methods to make cities and government more fair, more user-friendly, and just generally better understood. This event is meant to be accessible by all, and as a result is free, with meals and snacks provided as well. There will be a variety of presenters over the two days, and participants do not need a coding background to take part. Regular citizens who want to learn more and make a difference are welcome. When: Saturday, March 24th at 9:00 a.m. The Rosemount Writers Festival—a book fair and celebration of literary arts with local authors, publishers and other vendors—returns for a second year! This year’s keynote speaker is Lorna Landvik, local author of Patty Jane’s House of Curl, Your Oasis on Flame Lake, Angry Housewives Eating Bon Bons, and The View From Mount Joy. Enjoy a variety of other workshops focused on writing, publishing, and marketing. When: Saturday, March 24th at 7:00 p.m.
Northwest Metro sci-fi and fantasy geeks—come on down to the Buffalo Community Center for a casual meetup. The event typically starts off with an informal discussion of games, films, books, TV, and graphic novels before voting on what to watch. This is a very low-key event, and is steered by the interests of attendees. When: Saturday, March 24th at 8:00 p.m. The legendary Chicago and Toronto-based comedy troupe the Second City will be at the Fitzgerald for a night of thought-provoking comedy. If you enjoy sketch comedy and the ephemeral experience of improv, this night is bound to be a treat. Tickets range from $25–55. When: Sunday, March 25th at 12:00 p.m.
Shieldmaiden Sundays are a dedicated space for female nerds and geeks at Source Comics and Games. This is a recurring weekly event providing a space for women to play games, chat about comics, cosplay, or just enjoy the company of other geeks. When: Sunday, March 25th at 12:30 p.m. Gender Jam—a meetup group for trans, gender-nonconforming, questioning, and intersex youth—will be returning to the Totally 80s Trans Take-Over: Roller Garden Edition, an ’80s-themed extravaganza that strongly encourages sparkly/florescent/animal/rainbow print. In addition to skating, there will be arcade games and snacks. As always, bring your permission slip if you are under 18.